Lawrence J. White has an interesting article where he considers the optimal size of our financial regulatory structure. He acknowledges that the structure it is "maddenly complex" and that it "easy to make a case for drastic simplification." Larry also notes, however, that there are benefits to having some regulatory diversity. We need to recognize this tradeoff, he contends, when considering the simplification of our financial regulatory system. Regulatory decisions could be made faster, especially in a crisis, when policymakers need timely access to sensitive, proprietary information, and must coordinate actions both domestically and internationally. There would be fewer “turf wars” that can delay decisions. There would be less duplication and redundancy and less need for coordination among separate regulatory agencies... Regulatory costs would decrease, both for government (and thus for taxpayers) and for regulated firms. And there would be fewer opportunities for a race to the bottom, whereby a financial services firm tries to avoid (or reduce the burden of) regulation by “forum shopping” among regulators with parallel responsibilities who must compete for regulatees (their fee-paying clients). There also would be fewer incentives for one regulator to impede competition from financial firms under a different regulator. This is good economic analysis. It recognizes the tradeoff to simplifying the U.S. financial regulatory structure. Mark Calabria, Norbert Michel, and Hester Pierce similarly note this tradeoff in their call to reform U.S. financial regulation. They see the need for reform, but also want to avoid going to a single 'super' regulator for the reasons outlined above. It hit me when reading these two pieces this financial regulatory tradeoff could be summarized with a Laffer curve-type framework. 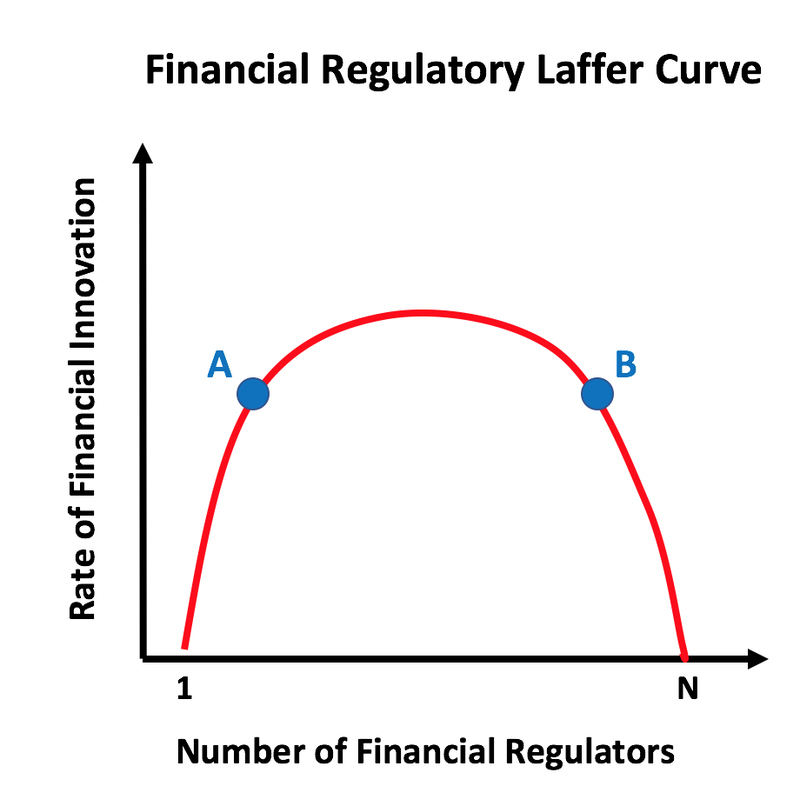 I sketched it out below with the rate of financial innovation on the vertical axis and the number of financial regulators on the horizontal axis. 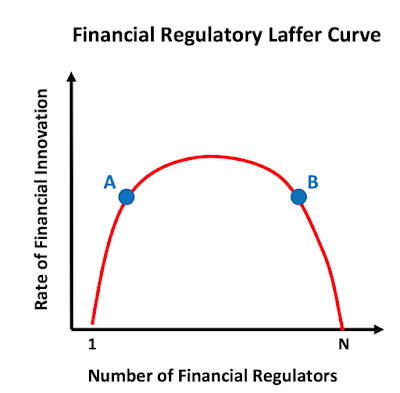 The number of financial regulators ranges from 1 (a single 'super' regulator) to N. The optimal number of financial regulators is the peak of this curve. The framework should be uncontroversial. What is controversial is where we are at on the financial regulatory Laffer curve. Are we closer to point A or point B? I suspect we are closer to point B. 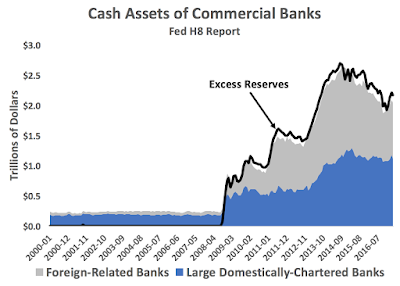 Who controls the Fed's balance sheet? The answer may seem obvious. 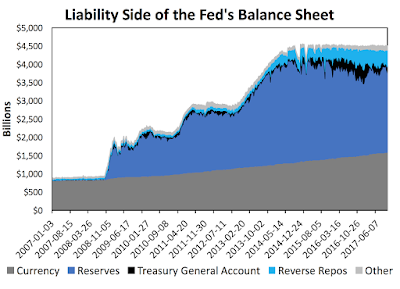 The Fed, after all, determines the size of its balance sheet. It also controls what happens to the asset side of its balance sheet. Its power over the liability side, however, is limited. This diminished control arises because the public's demand for currency, bank regulations, and U.S. Treasury cash balances all influence the composition of the Fed's liabilities.1 These are exogenous forces that have the potential to create some economic bumps on the road ahead as the Fed normalizes the size of its balance sheet. So far, though, little attention has been paid to these liability-side issues. Most focus has been given to the asset side of the Fed's balance sheet. This focus, in my view, is misguided. I see the real dangers lurking on the liability side of the Fed's balance sheet--the very side where the Fed has less control. 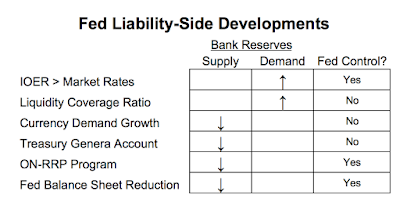 This post, then, is attempt to direct some attention to the liability side of the Fed's balance sheet. 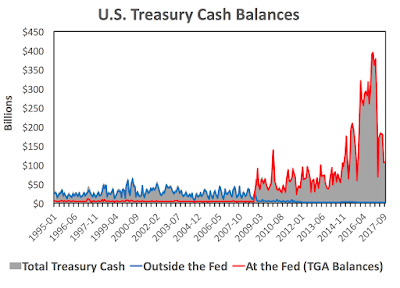 In it, I first explain how the public's demand for currency, bank regulations, and the U.S. Treasury cash balances are beyond the Fed's control but affect its balance sheet. I then explain how these forces and current Fed policy could interact in a disruptive manner. Consider first the public's demand for currency. It grows as the dollar size of economy grows. 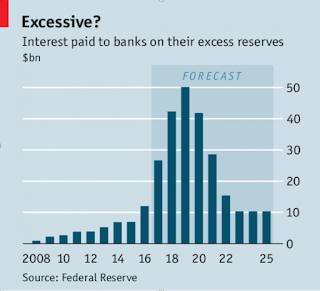 This growing demand for currency is met by banks turning reserves into currency. Some of this growing demand for currency comes from foreigners and some from domestic residents. As seen in the figure below, both have grown over the past decade. 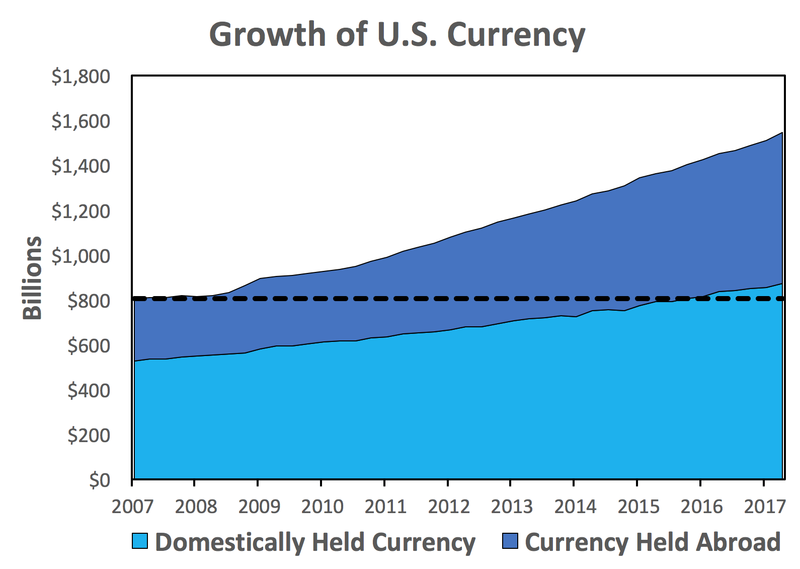 In total, currency grew from around $800 billion in 2007 to $1.58 trillion today. The almost $800 billion increase in currency means, ceteris paribus, a similar-sized decline in reserves over the same period. 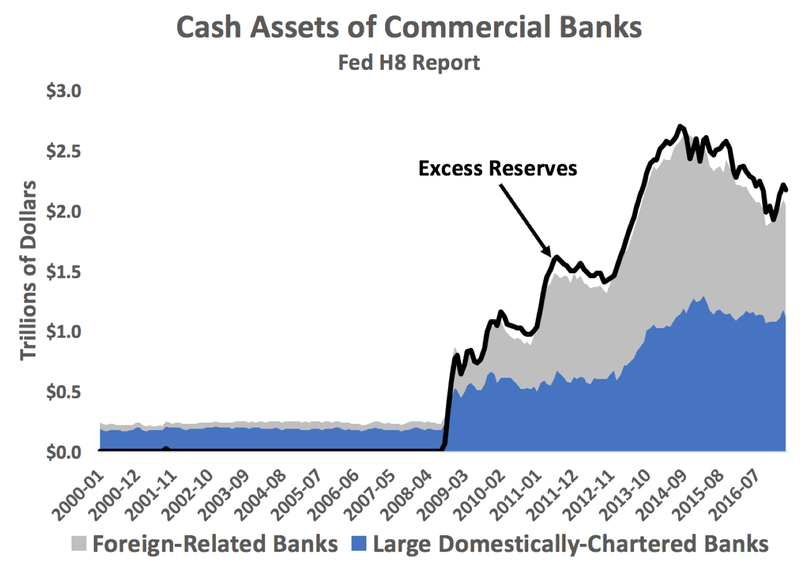 This development matters because the nearly $800 billion loss of reserves and gain in currency, though fairly predictable, was largely beyond the Fed's control. 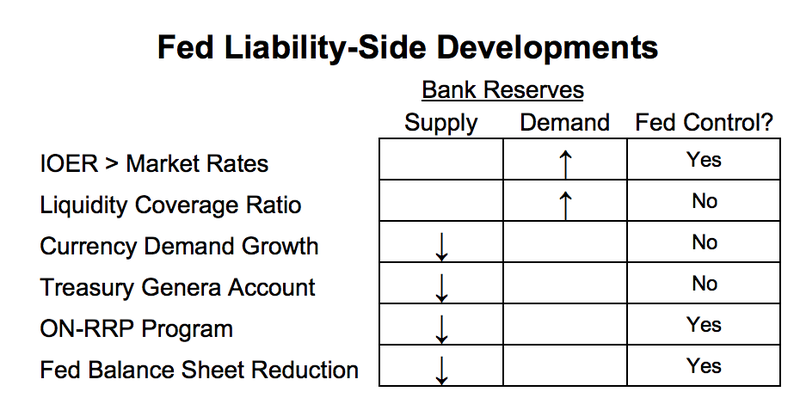 Put differently, the Fed controls the initial level and form of bank reserves, but it loses control over time. 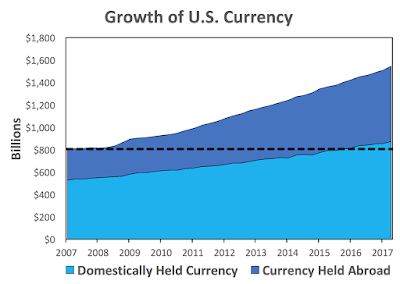 If the Fed were trying to stabilize a certain level of reserves--say to keep its floor system working--this steady growth of currency demand makes it harder. This is a powerful force with which the Fed has to contend. Now the currency demand growth may be seen as plus since it reduces the amount of balance sheet reduction required going forward. But it also poses some challenges that I will discuss later. For now, note that the growth in currency demand is an exogenous force that steadily tugs at the composition of the liability side of the Fed's balance sheet. There have been a lot of new bank regulations since the crisis, but here I want to focus specifically on the liquidity coverage ratio (LCR). It requires banks to hold enough "high-quality liquid assets" (HQLA) to withstand 30 days of cash outflow. Unsurprisingly, the LCR has increased demand for HQLA assets. In particular, it has increased demand for bank reserves and treasury securities which can be held at full value (other assets, like GSEs can be held but at a discount). The LCR was implemented in January 2015. 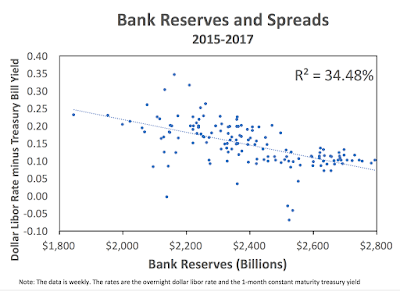 Per the LCR, bank reserves and treasuries are equally safe and banks should be indifferent between holding them for regulatory reasons. Per the banks, however, they are not the same. The IOER paid on excess reserves has been consistently higher than the yield on short-term treasury bills as seen below. This raises the demand for bank reserves relative to treasury securities. 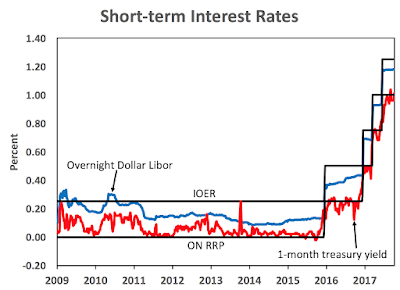 So the IOER being greater than other short-term market rates raises the relative demand for bank reserves and the LCR, which is beyond the Fed's control, intensifies this demand. The U.S. Treasury Department is also an exogenous force affecting the Fed balance sheet. There are several channels of influence, but here I want to focus on Treasury's cash balances that are deposited at various places. These deposits can broadly grouped into two categories: (1) interest-earning deposits held at private financial firms and (2) non-interest earning deposits held at the Fed in the Treasury General Account (TGA). Treasury, consequently, was losing income after IOER. Treasury officials quickly realized they could minimize this loss by pulling their funds out of private financial firms and instead park them at the Fed in the TGA.3 By doing so, however, Treasury officials were pulling out reserves from the banking system and therefore shrinking the aggregate level of bank reserves. 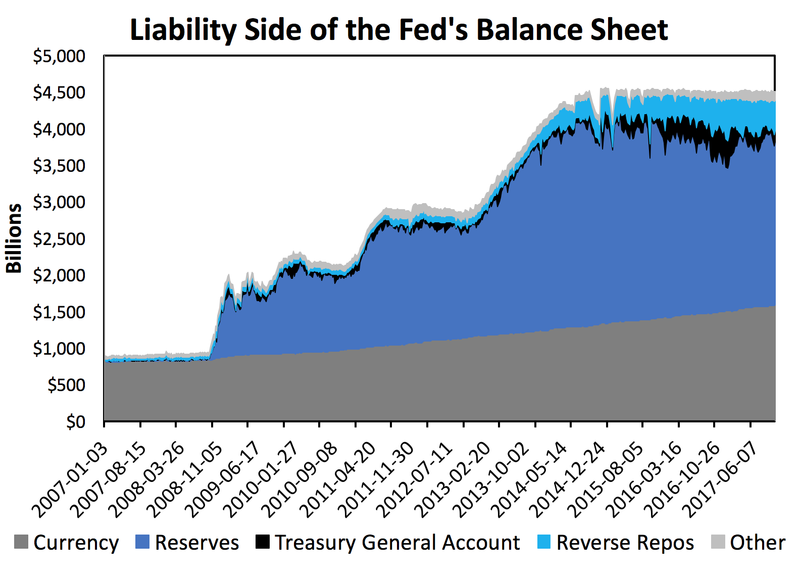 This change in the composition of the liability side of the Fed's balance sheet was beyond the Fed's control. So we have we have currency demand growth, LCR, and the TGA all exogenously affecting reserves on the liability side of the Fed's balance sheet. In addition, the Fed is affecting the demand for reserves with IOER being greater than market interest rates. The Fed is also draining reserves via its balance sheet reduction program and its overnight reverse repo program (ON-RRP). The table below summarizes these developments. These developments matter because, as seen in the table, they are pushing the supply and demand for reserves in opposite directions. Bank reserves have been shrinking because of currency demand growth, the TGA, and ON-RRP. At the same time the demand for reserves has been elevated because IOER is greater than short-term market rates. Since 2015, this demand has been elevated because of the LCR. And now the Fed is about to further heighten this imbalance by draining reserves as it begins shrinking its balance sheet. The figure below shows this is more than just a theoretical concern. 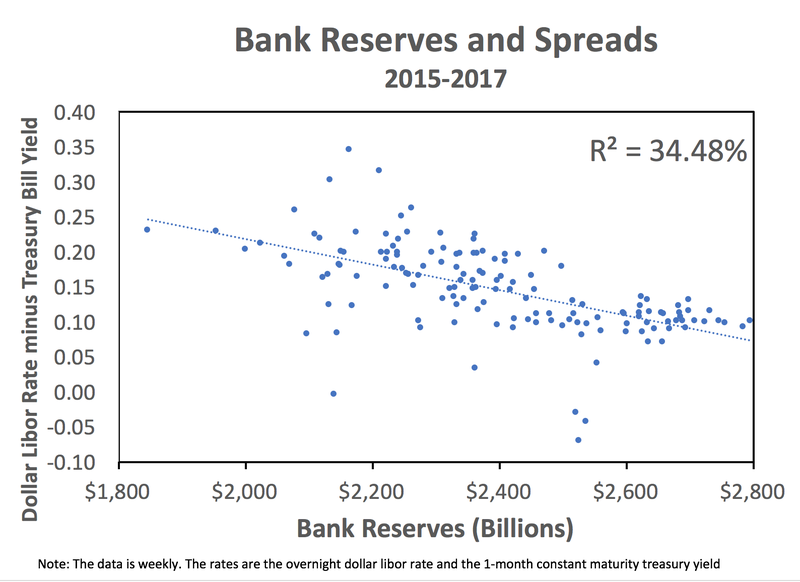 It shows the level of bank reserves since 2015 (when the LCR started) plotted against the spread between the overnight dollar libor rate and the 1-month treasury rate. There is a negative relationship which means as reserves fall the libor rises relative to the treasury bill rate. The increases are not terribly large and this only explain a third of the variation in the spread since 2015, but it does suggest further tightening will occur moving forward if nothing else changes as the Fed shrinks its balance sheet. So what should the Fed do? It could curtail the shrinking of its balance sheet, but that is not the path I would chose. The balance sheet reduction is already baked into market expectations and it should continue for other reasons outlined here. What it should do, in my view, is aim to bring the IOER closer to market interest rates. I am not sure how easy this task would be, but it would reduce the heightened demand for reserves, lower the TGA, and soften the bite of the LCR. One way to help push the IOER closer to market rates would be for the Fed to announce a corridor system as the final destination for the Fed's balance sheet reduction. This has not happened yet, but it should be something the FOMC seriously considers. 1 There are some other exogenous forces on the liability side that I ignore here. The biggest one being foreign official accounts at the Fed. These, however, generally are not too large and therefore less consequential. 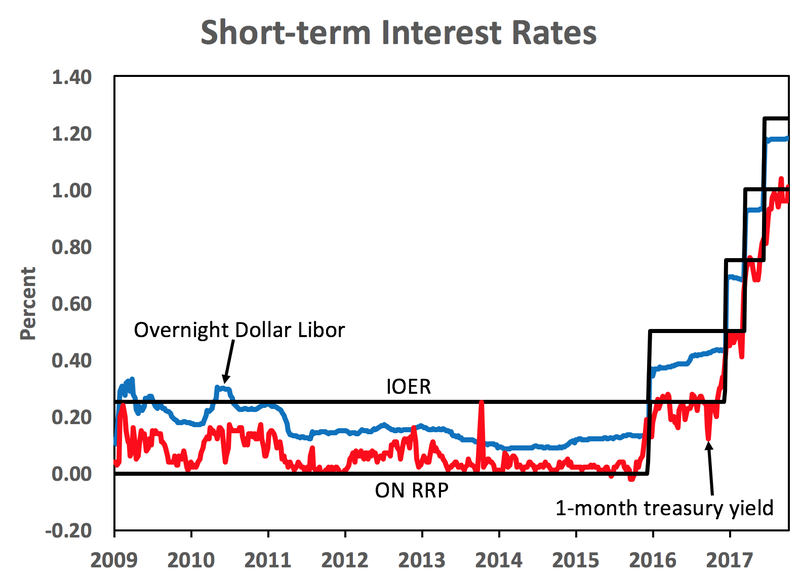 2 This was due both to IOER being greater than short-term market interest rates, but also because by law Treasury can only earn 25 basis points less than the federal funds rate at depository institutions. Treasury can also park funds in repos and in term deposits, but even these earn less than the IOER. See this NY Fed piece for more on Treasury cash balances. 3The IOER incentive to park funds in the TGA was reinforced by new Treasury policy in 2015 that raised the minimum size of the account to $150 billion. Several observations from this figure. 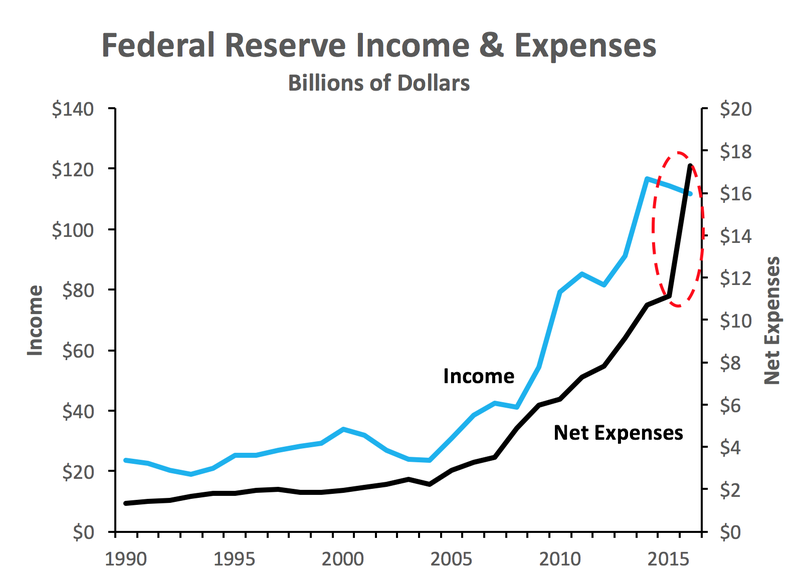 First, the sharp growth in the Fed's income is unsurprising as it is a natural consequence of the Fed's QE programs. These large scale asset purchase programs expanded the Fed's assets from around $900 billion in late 2008 to $4.5 trillion today. Moreover, the Fed's portfolio has changed from being mostly short-term treasury securities to one of long-term treasury and agency securities. In addition, the Fed also started paying interest on excess reserves (IOER) to banks during this time. Together, these two developments have effectively turned the Fed into the largest fixed-income hedge fund in the world. Hence, the surge in the Fed's income. 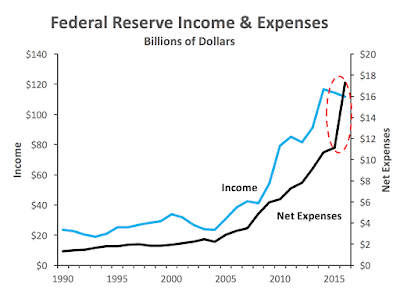 So expect the Fed's net expenses to keep growing at a healthy pace for the next few years as it pays out larger and larger IOER payments to large domestic and foreign banks. As I have argued before, this is bad optics and will make the Fed's large balance sheet an increasingly toxic issue for Fed officials. Something will have to give. 1Technically, the Fed has what Stephen Williamson calls a 'sub-floor' system or what George Selgin calls a 'leaky floor' system. Thus, there is a floor beneath the floor, the RRP rate which catches the financial 'leaks' which make it through the IOER rate. Still, the IOER guides all the other rates and is the main instrument of policy. 2It goes without saying that another key objective for the next Fed chair and the FOMC should be a move towards a NGDPLT. Both this and the move to a corridor system would be complementary.